The mocking laughter; the bullying; the negativity. Voices in my head. Lies, lies and more lies. The devil gets in our heads and thoughts and enjoys the mocking and the name-calling and the sarcastic bullying. But the voices of condemnation and negativity are not true. Maybe a sarcastic boss or a bullying coach thinks demeaning your character or tearing you down in front of others will be an encouragement but in reality it is usually something said out of fear or control or anger to make themselves feel better. Maybe it was something that was said when you were younger and you can’t get that voice out of your head. Maybe it was something that was said in a constructive way but you twisted it around in your head and made yourself feel worthless. The devil likes to use these tactics. You hear so many voices in your head that you lose sight of who you are and WHOSE you are. But there is a voice worth listening to. No it’s not the latest trending tweets or internet sensation. It’s not the latest podcast or the top-rated late night talk show host. It’s the Voice of Truth. The voice of our risen Savior. The voice of God. 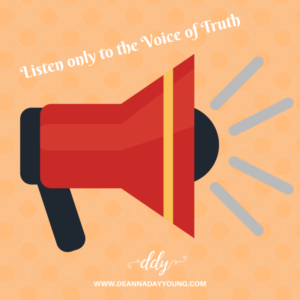 Casting Crowns has a song titled “The Voice of Truth” and in the lyrics of the chorus it says that there are many voices calling out to us but we get to choose which one to listen to. We can choose the Voice of Truth. Are you hurting today or feeling that you are worthless and unloved? Does the voice of the devil have a hold on you making you think you are not worthy of God’s love? Does the voice of lies have you thinking this world is the answer instead of Jesus? Stop right now and shoot down those lies from the voice of destruction and choose to listen to the Voice of Truth because the Voice of Truth is also the Voice of Freedom. Of all the voices in your head, choose Jesus because His voice brings strength and comfort, guidance and love. Choose to listen to the voice of Jesus today. This entry was posted on April 5, 2018 with tags: #castingcrowns, #voiceoftruth by Deanna Young.